Journalling is a valuable tool for chipping away at emotional pitfalls and personal stagnation, and this dynamic guide helps unleash the thoughts and inspiration that lay within each individual. Including the latest scientific research, this comprehensive workbook draws out the connection between the brain, body, and stories that help define a path towards achieving personal life goals. Guided exercises with step-by-step instructions help focus the journalling towards unveiling the unique, curious, and amazing qualities embodied in each person and how to embrace them. Describing seven distinct benefits of journalling, this guide provides the tools needed to manifest personal changes for a more fulfilling and dynamic life. 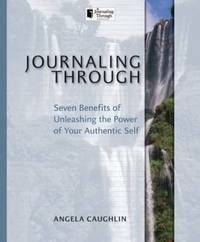 Angela Caughlin is a psychotherapist, the author of The Only Way Through, and a presenter at workshops and conferences. She was the program director of Bo's Place, a children's grief center. She maintains a private counseling practice and has been involved in pilot programs at the Rockwell Foundation and the Transition Medicine Clinic at Baylor College of Medicine.